Lifestyle Wellness Coaching, Third Edition CE Course, offers an understanding of evidence-based coaching and systematic processes to guide, support, and motivate clients to achieve positive behavior change and long-term healthy lifestyles and practices. 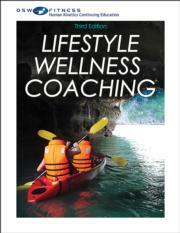 Lifestyle Wellness Coaching examines real coaching conversations to assess key considerations, such as the types of questions to ask, how to provide feedback effectively, and how to facilitate action planning. The course and included ebook present communication strategies to motivate, guide, inform, and support clients’ processes toward personal change with a holistic approach. Other issues explored include developing a trusting relationship, creating goals that are aligned with coaching processes, unblocking clients’ energy and discovering resources for change, and generating forward movement through the skillful use of the International Coach Federation’s 11 core competencies. Identify how coaches distinguish themselves from other helping professionals and how coaching differs from other health, wellness, and fitness roles. Identify the historical roots of coaching. Describe how learning styles and human development phases guide effective coaching. Explain the roles self-efficacy and self-regulation play in the change process. Outline the six stages of the transtheoretical model. Describe the flow model of coaching. Discuss moral principles, ethical guidelines, and boundaries relative to the coaching practice. Discuss how to create the coaching relationship. Explain and give examples of active listening, nonverbal communication, verbal and nonverbal encouragers, reflections of feelings, and reflections of content. Differentiate open, closed, and indirect questions and be able to use the power of questioning with clients. Use direct communication to provide feedback, address confrontations, share self-disclosure, and provide information, instruction, and advice throughout the coaching relationship. Explain how the Johari window is a framework for understanding clients’ awareness. Outline the qualities of effective goals and explain how to develop SuPeRSMART goals. Discuss the opportunities for careers in coaching.